Can you spot the difference? Invasive tunicate colonies on settlement plates collected by a team of aquatic invasive invertebrate specialists on Haida Gwaii. 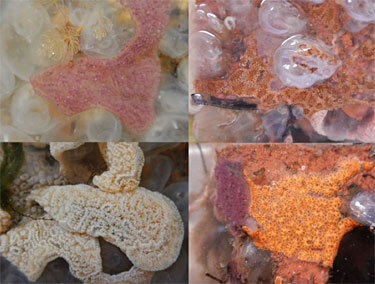 Clockwise, from the top left image: Chain tunicate; Star tunicate; Star tunicate and Chain tunicate; Chain tunicate. Photo credit: Haida Nation/Stuart Crawford, Marine Planning Program, Council of the Haida Nation. Slimy and brightly coloured, these aliens – otherwise known as Chain tunicate (Botrylloides violaceus) and Star tunicate (Botryllus sclosseri) – spread across docks, boats, gear and the rocky seafloor, smothering seaweeds, barnacles, shellfish and any other species in their path. Because of their ability to overgrow and spread quickly, invasive tunicates are considered a big threat. They can reduce natural biodiversity, damage infrastructure, invade key recreational areas and result in major costs to aquaculture operations. Hunting for tunicates is a relatively simple affair: flat ceramic squares called “settlement plates” are weighted with chunks of brick and lowered to one meter in depth in the water column. The plates are then collected a few months later and analyzed using microscopes for signs of an alien invasion. This is the third year that the hunt has taken place. In 2014, the team put out their first sampling plates, which they collected and analyzed in the fall of 2015. This process has been repeated twice with more plates being dropped into Haida Gwaii waters every year. 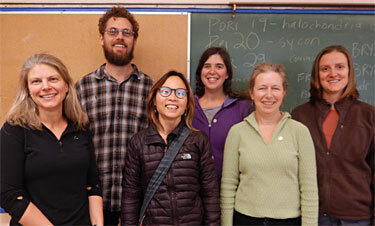 Meet the team (from left to right): Erika Anderson (Fisheries and Oceans Canada), Stuart Crawford (CHN – Marine Planning), Lynn Lee (Gwaii Haanas), Vanessa Hodes (Fisheries and Oceans Canada) and Linda McCann and Kristen Larson (Smithsonian Environmental Research Center). Missing from photo: Lais Chaves (CHN – Marine Planning). Photo credit: Jacquie Lanthier. Supported in part by the Marine Plan Partnership (MaPP), in the spring of 2016, CHN staff put out fifty plates in five locations; Gwaii Haanas staff put out an additional forty plates in four locations (see map below). “We wanted to see how far the invaders had spread,” says CHN marine ecosystem-based management (EBM) coordinator Stuart Crawford, “so we looked at several new sites that have never been monitored for invasive species.” This included sites on the Daawuuxusda/Duuguusd west coast, Ḵ’iids Gwaay/Ḵ’iis Gwaayee Langara Island and Moresby Camp. Minimizing the introduction and impacts of invasive species is a priority objective in the MaPP CHN-B.C. Haida Gwaii Marine Plan (2015). The CHN and the Province of B.C. will continue to collaborate with Gwaii Haanas, DFO and the Smithsonian Environmental Research Center on monitoring aquatic invasive species in Haida Gwaii as part of the Haida Gwaii EBM monitoring program. The marine plan partners will be developing a marine invasive species management plan as well as educational and outreach materials to better prevent their introduction and spread in Haida Gwaii. Map of settlement plate sites. 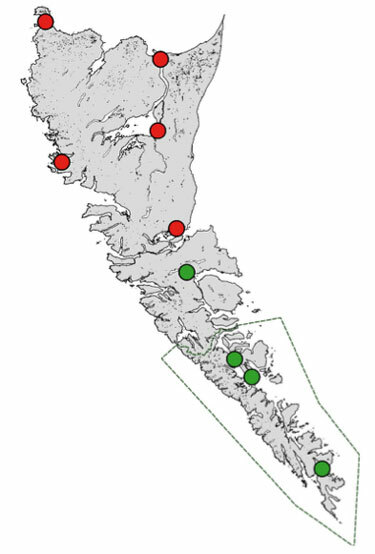 The red dots represent sites put out and collected by CHN staff, while the green dots represent sites where settlement plates were put out and collected by Gwaii Haanas staff. Map credit: Haida Nation/Stuart Crawford, Marine Planning Program. Tunicates in Haida Gwaii are here to stay. However, we can slow or stop the spread of tunicates or other invaders by early detection and intervention through measures such as periodic inspections and hull maintenance of the vessels that may inadvertently transport them from place to place. *Some opportunistic monitoring for aquatic invasive invertebrates by Fisheries and Oceans Canada also took place in Haida Gwaii in 2007, 2012 and 2013. In 2014 DFO secured funding for a three year monitoring program. This monitoring work was done by a contractor in 2014, but for the subsequent two years monitoring has been a collective effort by DFO, Gwaii Haanas, HOTT and the Smithsonian Institute. Just imagine – It is a beautiful spring day, and you’re out on your skiff with the family. Crab and prawn traps, coolers, and blankets are loaded. You are looking forward to a meal of crabs later on, but as you cruise towards your favorite spot, you see a row of buoys ahead of you and as you draw closer, you realize that your passage is blocked – you will have to turn back! 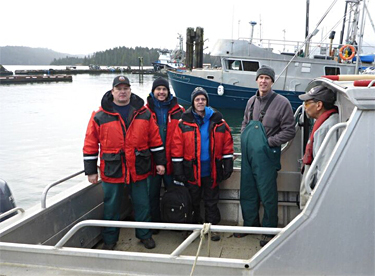 Brian Kingzett and the VIU team (from left to right: Brian Kingzett, Ramón Filgueira, Don Tillapaugh, and Dave Cake – and Captain Barney Edgars) survey Skidegate Inlet. Photo Credit: Stuart Crawford. 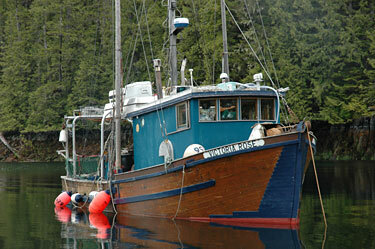 There is significant interest on Haida Gwaii to pursue shellfish aquaculture as part of a diversified marine economy. This interest is captured in the Council of the Haida Nation (CHN)-B.C. Haida Gwaii Marine Plan, which lists shellfish aquaculture as one of five areas available for marine economic development for the islands’ communities. Several inlets have been identified as having good potential for cultivating shellfish, including scallops and oysters, and the seasonal outdoor work associated with shellfish cultivation is well-suited to the islands’ existing labour force. But like a “choose your own adventure” book, the boating scenario above points to some of the issues that can arise when economic development is pursued without careful consideration of the cultural, social, and ecological activities in an area. To address those concerns a study known as a ‘carrying capacity analysis’ is usually carried out. This type of study focuses on the ability of an area to sustain a particular activity without compromising the natural environment, as well as ensuring that the people who live, work, harvest food, and recreate in the area are not significantly impacted by a type of activity. ‘Capacity’ is measured in different ways, depending on the activity that is being looked at: For example, in 1996 Gwaii Haanas established an annual limit of 33,000 visitor days and nights based on visual impact surveys as well as stakeholder and public consultation. The limit was developed to protect the ecological and cultural heritage of the area and to maintain a “wilderness” experience for Gwaii Haanas visitors. A ‘capacity’ study for shellfish aquaculture may focus on things like the location of traditional seafood harvesting areas, ocean views from the homes, and the routes of local tourism companies, to name only a few. In turn, a carrying capacity study may also inform management decisions related to the number, location, and size of permitted sites, as well as aesthetic requirements (e.g. the use of black or green floats to maintain views in an area) and direction on the types of species that may be cultivated. The Marine Plan Partnership contracted shellfish aquaculture specialist Brian Kingzett and Vancouver Island University to develop and apply a methodology to calculate the carrying capacity for shellfish aquaculture development in several key sites in the Haida Gwaii area, including Skidegate Inlet. Mr. Kingzett assembled a cross-Canada team that traveled to Haida Gwaii in January, 2016 for a site visit and meeting with CHN and B.C. technical staff to go over the proposed methodology. The CHN Marine Planning Program and B.C. staff worked with the consultants during the project and the teams are currently finalizing revisions to the report. “We’re definitely not bored.” That’s an understatement from Lynn Lee and her partner in life and work, Leandre Vigneault. 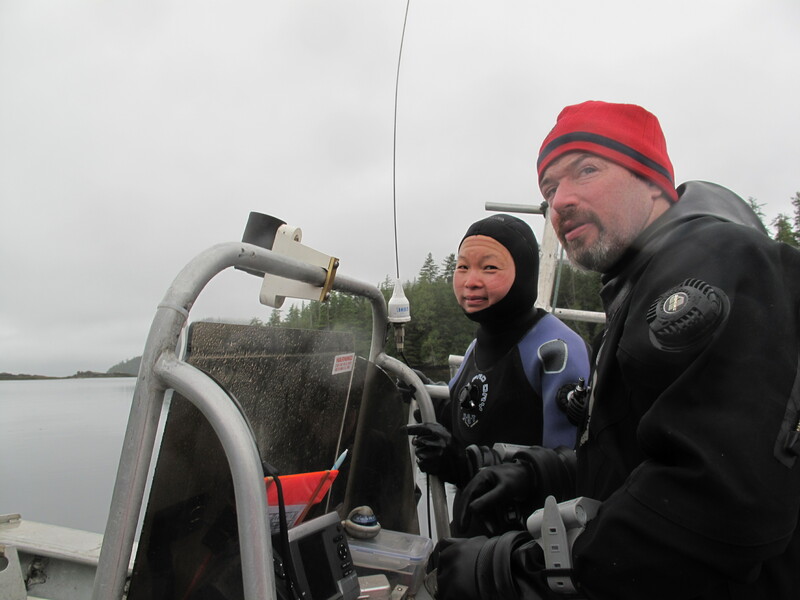 The two marine biologists, scuba divers and parents of a 12-year old boy, own and operate Marine Toad Enterprises Inc., a biological consulting company in business on Haida Gwaii for the past 18 years. One or both of them spend up to 100 days a year on the Victoria Rose, an ex-West Coast troller. Often working on separate contracts, they provide a wide variety of services from looking for herring spawn and counting salmon to assessing the impact of log dumps. Their clients include the Haida Nation, Fisheries and Oceans Canada and forestry companies. They also run Salt Spray Explorers, a small sport-fishing company that offers ocean-fishing and wilderness-exploration adventures. Vigneault, 43, has lived on Haida Gwaii all his life. He was born to a Montreal father and Toronto mother who came to Haida Gwaii to pursue a love of fishing, not knowing he was on the way. 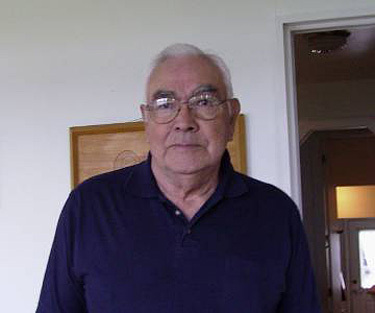 He spent the first 10 years of his life on a tiny island in the Masset Inlet, 14 nautical miles from the nearest road. “So, I’ve had a lot of time around water,” he said. 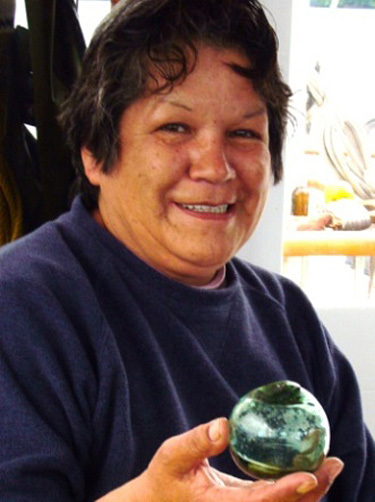 Lee, who is also 43, came to Haida Gwaii in 1993 after completing her undergraduate biology degree. 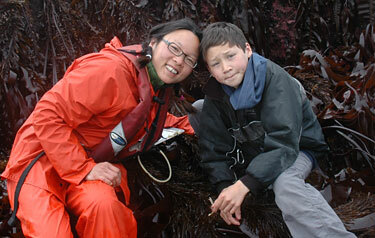 She is now working on a PhD focused on kelp forest ecology and the interactions between people, sea otters and abalone. Over the past decade, Lee and Vigneault also have found time to participate in four land or marine planning processes. They both sit on the Haida Gwaii Marine Advisory Committee (MAC). 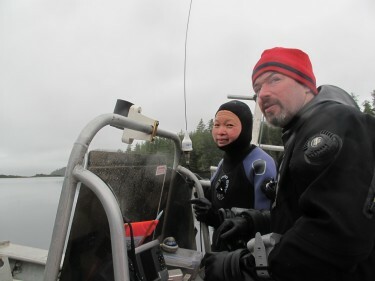 Lee brings academic research and marine conservation expertise to the Haida Gwaii marine planning process and Vigneault brings the perspective of a local, independent sports-fishing operator with a conservation ethic. When Debbie Beemer and Ray Stephens sold their small, successful seafood processing and smoking business to the Haida Enterprise Corporation (HaiCo) in July 2012, they found a buyer that would protect and build on the fine reputation they had established over ten years of operation in Masset on Haida Gwaii. HaiCo chief executive officer Kevin Ainsworth described Beemer’s and Stephen’s company as a well-run business that operated seasonally from June through mid-October. It was known for its customer care, attention to detail and high-quality products. The company processed sport fish from fishing lodges and added commercially caught product when possible. “We realized that the company at the time was highly scalable, hence the expansion that we’re undergoing now,” Ainsworth said. Now branded as Haida Wild, the seafood processing company is one of three business streams managed by HaiCo. The Haida Nation incorporated HaiCo in 2009 with the mandate to improve the economic, social, cultural and environmental well-being of the Haida and to create future opportunities on Haida Gwaii. The other businesses include a forestry operation and fishing lodges. While caring for loyal customers and maintaining quality, Haida Wild plans to increase its production to include catch from HaiCo’s recreational lodges as well as fish caught by Haida Nation commercial fishery licenses. As Ainsworth said, this will result in “a nice vertical integration strategy.” In addition, as production capacity, allows the company will buy more from local commercial and recreational fishermen. To achieve its growth goals, Haida Wild recently has expanded its facility to add a second processing line and a separate new 2,000-square-foot smoking facility. The expansion more than doubles Haida Wild’s capacity and allows the company to increase production of commercially caught fish, extend its season by three to four months and hire an additional 10 people. Haida Wild processes Ocean Wise-certified wild fish caught in Haida Gwaii waters. The operation processes salmon, sablefish, halibut and ground fish, and is considering adding prawns, scallops and crab. 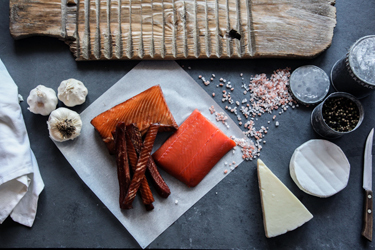 Smoked products include smoked salmon, lox, candied salmon and possibly tuna in the future. “The key this year is to see the efficiencies of the expansion and to maintain the high quality,” Shawn Baybutt, general manager of Haida Wild said. In addition, the company is building its website, designing new product labels and developing a marketing plan. Market expansion possibilities include grocery chains in Metro Vancouver and elsewhere in B.C. The company also is exploring connections in Germany and France and hopes to introduce online direct sales in the future. Learn more about Haida Wild. Marine planning in the MaPP initiative draws from different sources of information, including Western science, local knowledge and traditional knowledge. A robust source of information on the North Pacific coast – where First Nations communities have lived for thousands of years – is traditional knowledge. This has involved documenting First Nations understanding about marine habitats, life and patterns that date back generations. Traditional knowledge is a critical resource for marine planning. It includes history, traditions, practical information and ecological knowledge. It also captures how, when and why activities are done in and around the ocean and offers observations and information about trends over time. Passing on knowledge from generation to generation continues today. In addition to traditional activities, Haida are involved in modern forms of resource stewardship such as an enhancement program focusing on Yakoun chinook. The older workers are teaching the teenagers how to catch fish, how to keep them until they’re ready to spawn and how to look after the fry until they become mature. Over time, it is also hoped that traditional Haida fisheries on the river can be reopened. For provincial marine planner Berry Wijdeven, the longevity of Haida knowledge about Haida Gwaii provides a type of information that is different from, but as important as, scientific knowledge. “The two complement each other,” he says. For Skidegate resident Diane Brown, who also goes by the Haida name Gwaaganad, traditional knowledge is her way of life. “It defines me,” she says. “It tells me what to do with each season.” Along with Hageman, Gwaaganad was part of the Haida Marine Traditional Knowledge Study, which has informed the MaPP initiative – in a sense, telling today’s community “what to do” about marine planning. Over the years, Gwaaganad had reason to learn many other types of traditional knowledge. She spent nine years learning from her mother-in-law how to prepare fish. The long apprenticeship was crucial because the species of fish – sockeye salmon, also known as blueback – is so precious. “It’s such a valuable fish that novices aren’t allowed to wreck them,” she says. To learn more about Haida Marine Traditional Knowledge, please download a copy of the Haida Marine Traditional Knowledge Study (three volumes). 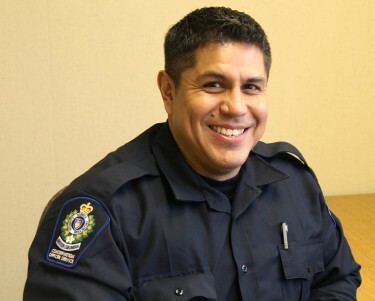 A young Haida man is currently a training recruit at the Western Conservation Law Enforcement Academy in Hinton, Alberta. He will be the first ever Haida to act as a natural resource compliance and enforcement officer on Haida Gwaii. Bell will be fully trained to Ministry of the Environment conservation officer service standards with all the associated responsibilities, including responding to complaints and investigating suspected legislative contraventions. Enforcing rules about resources – in the most efficient and effective ways possible – is the key goal of a new integrated compliance and enforcement program taking shape on Haida Gwaii. The integrated team involves the B.C. Ministry of Forests, Lands and Natural Resource Operations (FLNRO), Ministry of Environment, and the Council of the Haida Nation. They’re also working closely with Gwaii Haanas National Park Reserve, National Marine Conservation Area Reserve and Haida Heritage Site staff. Starting with land, and then moving to marine areas, the team hopes its efforts will result in a more integrated approach to compliance and enforcement for the islands. If things go well, this will also translate into saving money, says Leonard Munt, who is the district manager for FLNRO on Haida Gwaii. “We’re trying to move from the tops of the mountains to the abyssal sea, even though we’re just learning to walk right now,” he says. Noting that compliance and enforcement are complicated, Munt explains that one of the challenges the team faces is figuring out the cross-designation of the different jurisdictions. “Our ministry and the Ministry of the Environment have different authorities,” he says. Munt notes that this kind of collaborative approach doesn’t work everywhere. It’s effective in this region because the land base is relatively small and because he’s working with just one First Nation with very clear boundaries. “But this is a solution that works well here,” he says. The importance of this work is reinforced in Haida law. Under the Haida Constitution, the CHN is responsible for ensuring that Haida lands and waters are sustainably managed, continuing the traditional role of Haida watchmen who for thousands of years protected Haida Gwaii. Bell’s new position will strengthen the Haida capacity to achieve this, alongside ongoing marine monitoring and management activities fulfilled through the Haida Fisheries Program and Haida fisheries guardians. Haida Gwaii is made up of over 150 islands that stretch approximately 250 kilometers north to south.